Today, I am here to give solutions to a problem which all of you must have been going through. 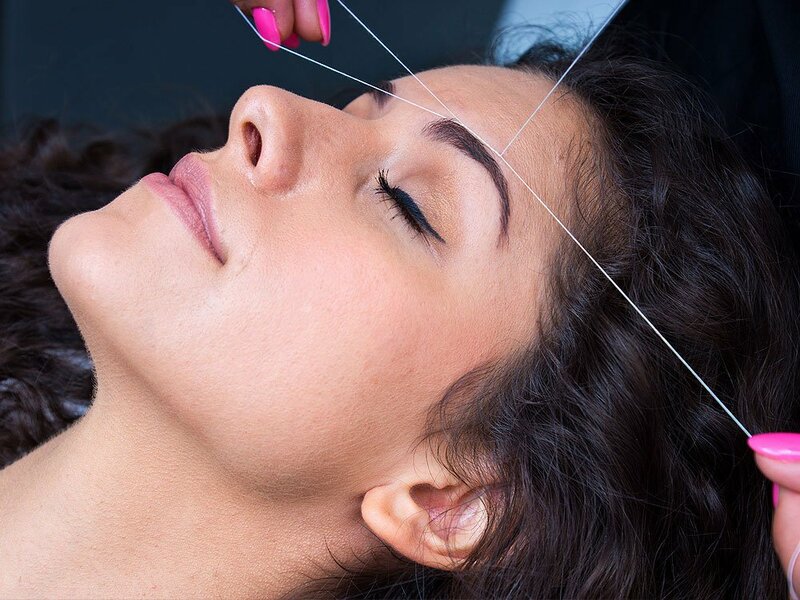 Every fortnight or so, we visit salons for our eyebrows and upper lip threading, and experience pain. But, by following these tips, it will get reduced to a great extent. • Always communicate with your esthetician. Science says, the more you speak, the more your mind is diverted and you are able to bear pain. • If your beautician is using tweezers, ask her to place the tweezers in freezer for 15 minutes as this will cool the tweezers down. This helps the skin feel fresh and ready for hair removal. • Prepare your mind already, that yes it is going to be painful and your skin has that capability to bear pain. • After threading, applying few drops of moisturiser helps in allowing skin to relax and breathe. Skin needs rest after being stretched. Hence, massaging helps the skin to feel fresh. • Toners also cool down the skin and help it to become normal again. • Astringents play a powerful role in healing the skin. They clog up the pores and cool down the skin and at the same time, help in preventing bacterial infections. • Although, some dermatologists say that skin should be left untouched after hair removal as its pores are opened and it is vulnerable to attract bacteria. It is your sensitivity and belief. • Accept that you have a sensitive skin, and red rashes are meant for your skin. No need to be afraid of them as they will get away in few minutes, or maximum in hours. • Rub ice cubes on the affected area. No need to hold the cubes at a place for some time as it causes irritation and more pain. Instead, rub it in circular motion, clockwise or counterclockwise. • You also have a good option of washing your eyebrows with cold water. This is meant to give instant relief. But don’t forget to pat dry skin after it soon. This increases the pace of lowering pain. • Do not use a razor if you are late for your appointment. This will make your hair growth harder and hence, the next time, you will experience more pain. • Friends, please do not try a new beautician every time. A regular beautician becomes adaptable to your skin and she knows how to deal with your skin type. Also, your skin tends to adapt the same hands and skin feels friendly. • Also, make sure you visit a trained esthetician. Do not be a guinea pig of any new comer. They will practice on your skin and invest a lot time and might end up hurting your skin. This will make you go through a lot pain too. • Stretch your skin properly as recommended and suggested by the person. Pay attention to what he/she is asking. This will help you. • No need to wait for full hair growth. You can visit salon for even touch ups. This will make you feel lesser pain as less hair is equal to less pain. • You can also apply mint toothpaste on your skin before threading. Mint has the property of cooling and hence, skin is already cooled down and ready for threading. • Cooling gels and cold creams can also be applied on freshly threaded skin. Skin tends to feel better and refreshed. • Since sun is super hot, it will lead to rashes. Yes, avoid skin for few hours if you have sensitive skin! Skin feels upset under sun exposure after threading. • Talcum powder before threading has two properties. First, it allows hair to look clearer. Also, it makes skin smoother and hence leads to lesser pain. • Avoid caffeine or alcohol. This makes skin extra-sensitive. I am very possessive about my eyebrows and don’t even let a new girl thread them. A months ago, I had and she ruined the shape. :( Coming to the pain, I will surely try some of these tips. I don’t know how we”ll use a razor for threading but I do use ice to calm my skin.. I need a lil help here….I have some hair in my upper lips. But I do not go for threading as I often see women who have just threaded the upper lips n it looks swelled (much like monkeys)……any way to change/reduce that? I thread my upper lip myself every weekend. Never have had any problems with swelling. Initially, though, when I first started out, I would get tiny cuts, because I didn’t know how to use the thread correctly, and would end up pulling (and cutting) skin. Now it hardly takes a minute and I’m done! Takes you a couple of tries to get used to it. Just remember to stretch the skin there over your teeth, just you’re giving a very an odd grin 😀 I looked through youtube videos to help me learn how to thread. May help you. I thread my entire face by myself. For the eyebrows and pain, I suggest threading the upper side, and tweezing below. Much less pain this way! Because of the looser skin below the eyebrows, the pain is crazy there… but it is not so much if you just tweeze. Great tips dear, but I wanted to know is there any tip r solution which reduces post threading effect of upper lip specially, it looks as if I shaved my upper lip and too embarrassing. What can be done for this?